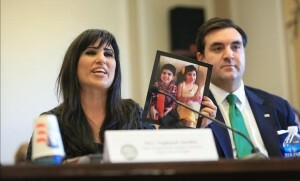 WASHINGTON — The wife of an American pastor imprisoned in Iran testified before a Congressional panel on Thursday, pleading for government intervention as she expressed her fears surrounding her husband’s plight. As previously reported, Pastor Saeed Abedini of Idaho, a former Muslim, left Iran in 2005 and moved to the United States with his wife and children to find religious freedom. Last fall, he traveled back to Iran to build an orphanage and visit his parents—and was about to return to the states—when he was taken into custody. Abedini was later charged with threatening the national security of Iran, and for attempting to turn youth in the nation away from Islam and toward Christianity. He was then sentenced to eight years in Iran’s notorious Evin Prison, where he has spent the past year. Last month, he was transported to Rajai Shahr Prison, which poses an even greater threat to Abedini’s health and safety. The pastor’s wife also expressed her disappointment in the government and her real fears that her husband could lose his life in prison. “While I am thankful for President Obama’s willingness to express concern about my husband and the other imprisoned Americans in Iran during his recent phone conversation with Iran’s new president, Hassan Rouhani, I was devastated to learn that the administration didn’t even ask for my husband’s release when directly seated across the table from the leaders of the government that holds him captive,” she said. Jordan Sekulow, executive director of the American Center for Law and Justice (ACLJ), which has been fighting for Abedini’s release, also testified before Congress on Thursday. “It is my hope that, through the continued interest of Congress, Pastor Saeed’s case will be elevated to the highest levels of priority for our executive branch, that he will no longer be discussed on the margins, but rather that our government would truly do everything within its power to bring this U.S. citizen home to his wife and children,” he stated.